Adolf Marcuse : Surf Riding in Hawai'i, 1892. Verh. der Gesell. fur Urdkunde, 1892, p. 492. Deutsche Rundschau, Berlin, August 1893. Translated by Helen H. Smith. Volume 10, Issue 1, 1894. A fairly basic description of surf riding. When landing in a whale boat manned by natives at Punaluu, Hawaii, Marcuse notes they "shot like arrows through the raging surf, about 13 feet high," page 18. 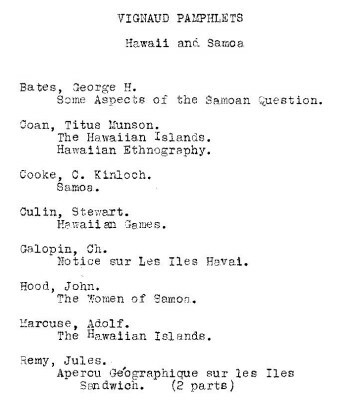 This is a collection of magazine exerpts on Hawa'i and Somoa, apparently collected by "Vignaud." The contents are listed, with the known dates of publication in [brackets]. 1. Deutsche Rundschau, Berlin, August 1893 and Verh. der Gesell. fur Urdkunde, 1892, p. 492. We sailed into the harbour formed by the surf-beaten coral reefs. The entrance is by a single narrow channel. On the wharf at Honolulu the brown natives mingled with white men and half-castes; pretty, mostly one-storied, houses surrounded by palm gardens clustered round the bay, and in the background rose the high picturesque hills, the whole forming an harmonious, thoroughly tropical picture. The life of the Hawaiian people is rich in original characteristics. They are genuine islanders, and love the sea above all else. There are hardly anywhere to be found more expert swimmers and fearless divers, and the length of time the latter can remain under water is certainly unsurpassed. Armed with only a knife, they plunge in and combat the sharks, so dangerous in that locality. Whenever a high surf approaches the coast they swim out into the sea, taking with them a plank fashioned expressly for the purpose, on which they ride in again on the crests of the waves. Their sharp and experienced eyes detect a shoal of fish between the shore and the coral reefs before a stranger could see it with a field-glass. As soon as the shoal has come near enough to the beach, the men spring into the sea, some to stretch out a great net, and others to drive the fish into it by loud cries and beating of the water. In this way they often take a copious haul in a few hours, which they divide honourably; and in this division even the stranger who has been curiously watching the proceedings is not forgotten. About 2 o'clock in the morning we saw, at a distance of 60 nautical miles, the huge fire of the volcano Kilauea (about 4400 feet high). In the complete darkness of the night it presented a spectacle at once terrific and beautiful. Every minute the height and form of the pillars of fire and smoke altered; the crater often illuminated all the surrounding mountains with an intense red light, like a lighthouse erected by the powers of nature to facilitate navigation. Shortly after sunrise we were landed in Punaluu. Our boats, rowed by strong and skilful natives, shot like arrows through the raging surf, about 13 feet high. After a very short rest we left Punaluu by a small railway car, which, being generally used for the carriage of sugar-canes, was but scantily furnished with seats. Geoff Cater (2013) : Adolf Marcuse : Surf Riding in Hawai'i, 1892.